In the recent years, the need for a more rational and efficient use of energy has emerged as a strategic and urgent issue. Such a necessity is particularly perceived in the iron and steel production, not only because of the increasing costs of energy, but also as a consequence of the competition, which stresses some features of the process and its final products (e.g. cost and quality). Also, the rational use of the energy resource may be regarded as a twofold issue, a first aspect being related to the achieved consciousness of the limited availability of energy, regarded as a source, and the second being represented by a mature appreciation of the costs born to procure energy. Globally, ever increasing consumption of energy has gone hand in hand with rising concerns about its conservation. Apart from being expensive and prone to sudden price fluctuations, the overwhelming majority of energy sources are non renewable. Therefore, the conservation of energy is considered vital not just to avoid wastage of a precious resource, but also to slow down the rapid depletion of coal, oil, and natural gas resources. However, with the environmental movement gaining ground in the past 30 years, the ramifications of unsustainable energy use are no longer confined to economics alone. As the bulk of greenhouse gas (GHG) emissions are a result of fossil fuel burning, conservation of energy is today intrinsically linked to the climate question. As halting fossil fuel use is not an option without the viability of alternative sources, the only way to reduce energy use and manage emissions is therefore to maximize its efficiency. Since the iron and steel industry presents one of the most energy intensive sectors within the economy of any country, it is therefore of particular interest in the context of both local and global environmental discussions. The profile of energy efficiency has risen recently, due to increased concerns about local and global environmental impacts of energy use. Challenges to energy security have also brought energy efficiency to the fore, as they directly contribute to reducing energy use. Energy efficiency in iron and steel production is crucial, to ensure reduction in production cost, the competitiveness of the steel products and to minimize environmental impacts, such as GHG emissions. Most of the energy input in an integrated steel plant comes from fuel and electricity. The energy from fuel mainly comes from solid fuel (mainly coal) and only small input comes from liquid and gaseous fuels. Fuel in the iron and steel production is used to provide heat energy. It is also used as a reductant to reduce iron ore to produce iron. Electrical energy is used to meet process needs, running the motors and lighting of the facilities. The person who first gave shape to the idea of energy efficiency was the American physicist and environmental activist Amory Lovins. Shaken by the oil crisis of 1973, Lovins postulated and popularized the concept of ‘negawatts’, a system of meeting the energy requirements not by exploiting greater quantities of energy, but by increasing the efficiency of existing quantities. In other words, to use an American expression, ‘getting the most bang from the buck’. Since then, everyone all over the world is working to fine tune existing technology or devise completely new solutions that maximize the value derived from each unit of energy. These efforts have been aided by support from people in authority, who have created an enabling environment for motivation to use energy efficiently. Iron and steel production is energy intensive. It is the largest consumer of energy among all industrial sectors. It is also the largest emitter of CO2 emissions. It constitutes a significant portion of the cost of steel production. The cost of energy as percentage of the total cost is in the range of 20 % to 40 % depending upon production route, type of iron ore and coal used, the steel product mix, operation control technology, and material efficiency. Primary sources of energy utilized in the iron and steel production encompass coking coal, non coking coal, liquid fuel oils, and electricity. Wherever natural gas is available it is used in the iron production. Of the various types of primary sources of energy, the coking coal holds the major share of energy used (65 % to 80 %). While coking coal, non coking coal and liquid fuel oils are primarily used in integrated steel plants, electricity by far presents the major input for steel making in mini plants using electric arc furnaces or induction furnaces. Energy intensity is measured in physical terms as specific energy consumption per unit of output (SEC). Specific energy consumption (SEC) is defined as follows. SEC is measured in GJ/ton of product. Industrial processes often use energy in different forms, such as fuels, steam and electricity, and the SEC of that kind of process is calculated as follows. Where E (fuels) is fuel consumption, E (steam) is steam consumption and E (electricity) is electricity consumption of the process. In most cases SEC is compared with best practice to determine the percentage reduction in energy per unit of output that could be achieved by adopting best practices. SEC for iron and steel production has reduced considerably in recent years. Today SEC in the energy efficient plants in the world using the blast furnace – basic oxygen furnace route, ranges from 17 GJ/ton of crude steel to 23 GJ/ton of crude steel. In not so efficient plants, it is ranging in the range of 25 GJ/ton of crude steel to 34 GJ/ton of crude steel. This variation of SEC is influenced by/depends on the iron ore and coal quality, the steel grade and the material efficiency. The open hearth furnace route is more energy intensive and less productive. Currently, only a very small capacity is still in use because of the replacement of this technology by BOF technology. The steel production route utilizing electric arc furnace does not require a coke or a sinter plant but the recycled steel scrap. The energy intensity of this route ranges from 9.1 to 12.5 GJ per ton of crude steel where the input is only the steel scrap. Another way to produce crude steel is by directly reducing iron ore to produce direct reduced iron (DRI). The average energy intensity is typically between 28.3 and 30.9 GJ per ton of crude steel. This technology mostly uses natural gas or non coking coal. These days there is a considerable interest in the world to produce DRI by using shale gas in those areas where it is available in abundance. Typical SEC and specific CO2 emissions of different shops in iron and steel plants in Europe is given in Tab 1. Energy interdependency in an integrated steel plants is quite complex. 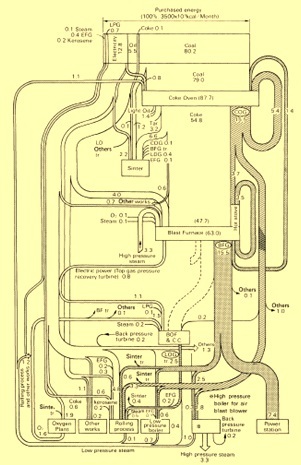 Fig 1 illustrates a typical example of the input and output flows of different types of energy and reducing agents together with the internal energy flow of a Japanese integrated iron and steel plant. The usual dominant inputs are coal, fuel oil and, if bought from an external supply, coke. These inputs are mainly used for the production of coke in the coke oven plant and as reducing agents in the blast furnace. It is common to use alternative reducing agents in the blast furnace, such as coal, coal tar or oil that are injected to the blast furnace at the tuyere level. Used oils, fats, various gases (e.g. coke oven gas) and other hydrocarbons, such as waste plastics, may also be injected. The quality (calorific value and cleanliness) and volume of the different gases vary significantly and these factors have an impact on where the fuels can be usefully used. To optimize energy efficiency, it is necessary that each fuel gas is consumed at the most appropriate plant. Energy management plays an important role in this regards. The primary task of energy management is the efficient distribution and use of the process gases and purchased fuels. A good plant layout can further facilitate this task. Coke oven gas (COG), blast furnace gas (BF gas) and basic oxygen furnace gas (BOF gas) constitute the basis of the energy system in an integrated steelworks. Most of the energy demand is satisfied by these gases; the remaining part must be balanced with purchased energy, normally electrical power and other fuels like fuel oil. Potentials for energy efficiency improvements build to a large extent on ongoing changes in the iron and steel sector. They arise from improvement in input factors, from technology conversion and retrofitting as well as from recycling and waste heat recovery. The potential in waste heat recovery, for example, is immense. Currently, over 50 % of the energy is lost in many of the steel plants. Losses occur as exhaust and by product gases that could not be used for electricity generation or low heat steam production. Although most of the measures for energy efficiency improvement are cost effective and provide net benefits within a certain time period, only few measures have been or are currently being implemented in many of the iron and steel plants. Barriers to energy efficiency improvement are mainly availability of capital in these iron and steel plants. Improvement in SEC is obtained through the following. By recovering the waste heat from the process. By improving the monitoring of the energy consumption through the energy management system. The areas of improvements are identified through proper energy audits. The audits can be done either in-house or through qualified external agencies. The areas of improvements are to be categorized in three categories. Short term – These are those improvement items which can be implemented with practically no investment or very little investment. These are usually process improvements, improved monitoring, recycling of waste, and improvements in process inputs etc. Medium term – These improvements need addition/ replacement of certain equipment/ instruments which have very quick pay period. Long term – These improvements need substantial investment and may involve scrapping of the old equipment/process. For implementing any of the above improvements management support is an essential ingredient. Without the support of the management, energy efficiency improvement program can succeed.